Dyslexia: Surviving and Succeeding at College is a practical and easy-to-read guide for dyslexic and dyspraxic students. Clearly and simply written, in a dyslexia-friendly format, it addresses not just study skills, but also more general aspects of coping with student life. how to organise your time and plan your work. Sylvia Moody recognises that adapting to student life generally is as important as developing study skills. Guidance is given to assist you in finding your way around campus, building relationships with tutors, managing emotional development and preparing for the world of work. Full of invaluable self-help strategies, this book will empower you to improve your skills in all areas. The book will also be useful to subject tutors who wish to learn about dyslexia, and to dyslexia tutors and co-ordinators who want to give practical advice to their students. 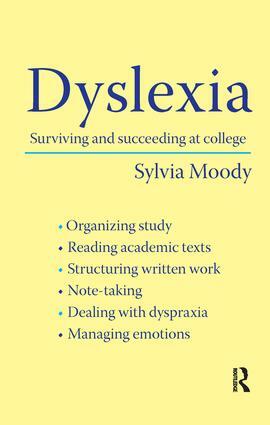 Dr Sylvia Moody is a freelance writer and psychologist specialising in adult dyslexia.